Patterns for free Grape Basket quilts are time-honored favorites. Use these patterns to create traditional quilts with reproduction fabrics and colors. Alternatively, choose vibrant, contemporary colors and designs to add a decorator look to your bedroom. Help reduce your stash and remnant pile with colorful Grape Basket quilt blocks. This pattern is composed of squares, rectangles and triangles to create a variation of the traditional basket pattern. Change the dimensions of the components to create different size blocks. Click on image to print the 6" block of the Grape Basket Pattern. Grape Basket quilt blocks can be used alone or in combination with other quilt block patterns to create a unique wall hanging, table runner, comforter or other home accessories. 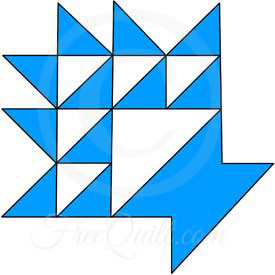 Download the templates and materials lists, along with sewing tips and how-to directions, to make your quilt assembly quick and easy. This site offers complete instructions, plus materials needed to get you started. Enjoy making this beautiful grape basket block using these instructions. This is a great little project to use up some small pieces of fabric. This quilt pattern combines two traditional quilt blocks, grape basket and oak leaf & acorn.